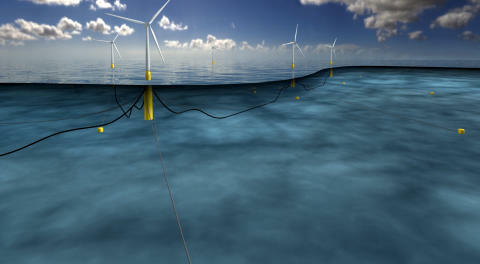 Each of the five wind turbines is anchored to the seabed by three suction anchors. NGI evaluated the ground conditions and performed the detailed design of the anchors. The technology of using suction anchors for offshore structures was pioneered by NGI and Statoil on an industrial scale during the 1990's. Suction anchor technology has been applied successfully to safely anchor and support more than one hundred oil and gas installations and fixed bottom offshore wind turbines worldwide. Suction anchors, in contrast to steel piles, have the advantage of silent installation - avoiding disturbance of the marine environment. At the end of their lifetime, they are also easily removed. "The planned area of the wind farm was carefully surveyed and NGI conducted advanced laboratory testing of the retrieved soil samples. 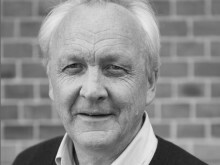 Ground conditions were found to be well-suited to suction anchors," says Technical Lead - Knut Schrøder, with his many years of experience of fixed and floating offshore installations. "Rough seas and powerful winds expose wind turbines to enormous forces. The main advantage of suction anchors is their ability to resist high loads together with their straightforward, environmentally-friendly installation. This represents an excellent solution for next-generation wind turbines, which will only increase in size and capacity," says Schrøder. Each anchor resembles an upturned bucket. Water is pumped out creating a vacuum inside, which makes the bucket penetrate down into the seabed. The suction anchors at Hywind are 5 metres in diameter and penetrate 15 meters into the seabed. Statoil is planning more offshore wind farms around the world based on Hywind technology. There are also plans to harness the power from floating wind turbines for the electrification of existing production platforms. Hywind Scotland was officially opened by the First Minister of Scotland, Nicola Sturgeon, and began operating in October 2017. 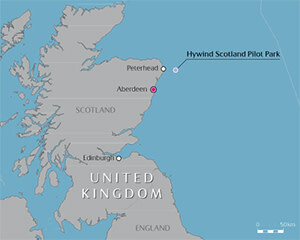 The wind park is located 25 km offshore from Peterhead, Aberdeenshire. Delivers 30 MW electricity, meeting the needs of about 20,000 homes in the UK. Consists of five floating wind turbines with a total height of 253 metres, where 78 metres are below sea level. Statoil is operator in partnership with Masdar. Read and see more about Hywind. Each of the turbines is anchored to the seabed by three suction anchors. This technology is based on cooperative work between NGI and Statoil during the 1980's and 90's. NGI conducted extensive advanced laboratory testing and numerical analyses that provided the basis for the design of the suction anchors. NGI's contractual partner has been Aibel. Aibel has had several assignments for Statoil in connection with the completion and installation of the wind park. Read about Aibel's work at Hywind. The first prototype of Hywind was constructed in Norway in 2009 on assignment from Statoil. NGI will chair the REDWIN Project - a new research collaboration for more economical offshore wind energy. The production of renewable energy increases year by year in Europe, and the development of offshore wind is crucial for a future without fossil fuels. However, overall costs need to be reduced in order to make offshore wind competitive. Suction Bucket Jackets are installed at Ørsted's Borkum Riffgrund 2 Offshore windfarm in Germany. NGI and FRAMO were engaged by Ørsted for the installation the installation. The engagement also included design and installation of comprehensive Structural Health Monitoring (SHM) systems on two of the jackets to monitor and verify behaviour of the structures during operation in the field. Date: 8/28/2014. International cooperation on new offshore wind Technology. DONG Energy successfully installed the world's first offshore wind turbine foundation based on the Suction Bucket Jacket (SBJ) technology.